How do you solve a problem like Tom Becket? How do you hold a fart when sitting down? How do you find the word that means Tom Becket? A flibbertijibbet! A will-o'-the wisp! A clown! Many a thing the King would like to tell him Theobald's missed, Tom has no leg to stand But how do you make him pay and listen to all you say How do you turn a foot into a hand? Oh, how do you solve a problem like Tom Becket? How do you wear a mood ring on your hand? His authority's abused, out of focus and misused Excommunicated fast-ly, what a sham Reprehensible as leather, say we rope him then we tether He's a monster! He's a demon! He be damned! He'd out pester any pest, drive a hornet from its nest He could ban you from the abbey for a burp He is mental! He is wild! He's a fiddle! He's too riled! He's a headache! He's Archbishop! He's a jerk! How do you solve a problem like Tom Becket? How do you drink a soda with no burps? How do you find the word that means Tom Becket? A heretic Bishop! A turbulent priest! A clown! Many a thing you know you'd like to tell him Many a thing to get him off our land But how does he go away and give our fair King his day How do you cook some ice cream in a pan? Oh, how do you solve a problem like Tom Becket? Where can I find a sword to fit his back? 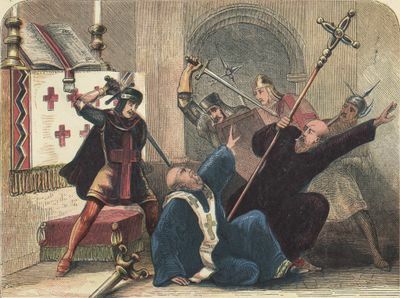 For those without comedic tastes, the so-called experts at Wikipedia have an article about Thomas Becket. For those without comedic tastes, the so-called experts at Wikipedia have an article very remotely related to Maria (Rodgers and Hammerstein song).